Specially designed for VoIP service providers who are looking to start own VoIP Business at very interactive price. Rich Reporting module with graphs customer point / Destination point reports. iKcon Infotech provides ikcon Switch on a hosted basis with a month to month rent option. Facilitated VoIP Softswitch offerings are perfect for little and medium size IP communication benefit suppliers for retail and are similarly valuable for transporter review benefit suppliers for discount who would prefer not to take the bother of keeping up and checking the Softswitch server. Advanced reporting system gives you access of each and every reports. If you have multiple gateways and different pricing for same country, system will pick the least price for that particular country from the list. Real Time Alerts keep you posted for any update or changes in the switch which you need to know. With Real time billing your users will not extend their limits, calls will be stopped when not appropriate balance. Own product means which comes with your company’s branding and logo. Get complete White Label System. You can create several rate groups for separate clients, and can enter expiration date of Rates. iKcon Switch is compatible with Wholesale and Retail, so you can do both with one switch. Multiple Billing Module with Prepaid / Postpaid Billing Cycle. Auto Recharge a customer as per your needs. Can send credit notifications via Email / SMS to customers. Can Create Multiple SIP accounts for a single customer. Custom Invoices for each customer. Can update / Edit multiple customers at once. Has a Mass Mail Feature where you can send a product email to multiple customers. Customer has their own reports section which includes (CDR / Rates, etc). Resellers can have their own customers and can manage them from their portal. Custom rate Management for Resellers. Resellers can generate invoices for their customers. Resllers have their own reports section. Resellers can manage their own DID’s and assign it to their customers. Can Support SIP / IAX / H.323 protocols. Can Switch SIP over TCP for Microsoft OCS Authentication. Username and password / IP authentication / prefix authentication. Can manipulate Caller ID as needed. Can Support G.711 / G.729 / G.732.1 / GSM codecs. Can Transcode Codecs as per your needs. Can have 2 options for calling card authentication. Can assign Caller ID for pinless authentication. Can Create custom IVR’s for Calling Cards. Can automatically assign caller ID to Customer and their calling cards. Can Create your own IVR. You can change your Caller ID through the IVR. Access / Manage Calling Cards with IVR. Receive Balance IVR on every call. IVR plays the rate for the dialed destination. Generate Multiple Calling Cards at once. Setup Margin / Mark-up for each call from customer. CDR’s / Margin reports on Dialed number. Route DID Calls to various destinations. Client can purchase DID and you can re-assign the DID. Admin / Reseller can allocate DID’s to customers. Can send calls to VoIP trunks. Detailed report for the DID. Full Report of Refill / Payment and transactions. Can use the online portal for payments. Control manual Payments from the portal. Automatic Invoice Generation and Emailing the clients. Invoice Creation / Editing / Deleting. Reseller can user their own details for the Invoice. All resellers can configure their company details for the Invoice. Simple GUI for Rates Management. Create different Rate Groups for Customers / Resellers. Can Create multiple packages for customers. Can select carriers for each rate. Can select subscription for a rate group. Two types for routing policies LCR (Least Cost Routing) or LCD (Least Cost Dialling). Can Automatically select the route as per the routing policies. Can Import rates from excel. Can search rates / updates / history. Linux CENTOS 7.x (64 bit) (complete installation). VoIP Carrier which supports SIP calls, g711, g723 and g729 codecs. How many Concurrent calls iKcon Softswitch can handle? Upto 2000 CC, its entirely depend on server specifications. Can I have Payment Gateway of my wish integrated to the system? Yes, Payment Gateway can be integrated as per your requirements.Currently supported Payment Gateways are PayPal, Moneybookers, Skrill. Does it Support Calling Card Solution? Yes, It does support Calling Card System, It has all the latest features which is required for Calling Card Business. What about Security? Is iKcon Softswitch secure? 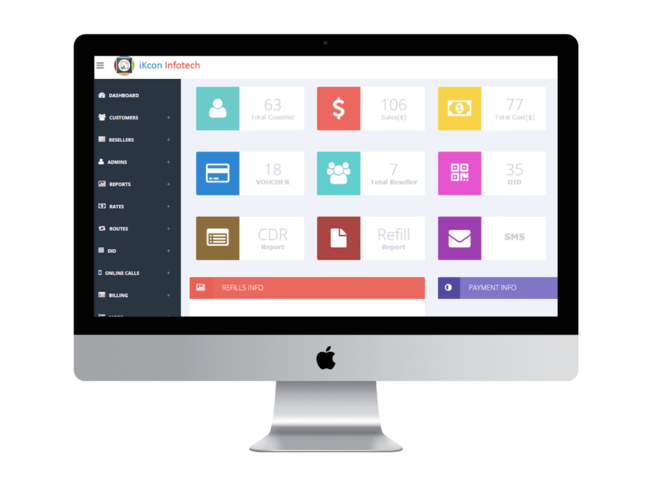 iKcon Softswitch is Completely secure system with Features like Fail2ban, protect from Mysql injection, Ddos attacks, etc. What are billing increments ? Here are our billing increments by location: USA and Canada: 1 second initial; 1 second increments Mexico: 60 seconds initial; 60 second increments Gambia: 60 seconds initial; 1 second increments Other countries: 1 seconds initial; 1 second increments. What codecs are supported ?